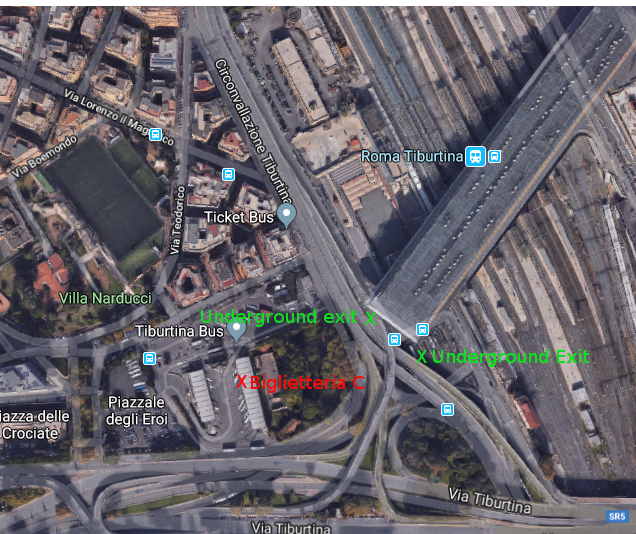 Please, check if your bus to Rome leaves at “Hotel Amiternum” bus station (4 km from city center) or “Terminalbus Lorenzo Natali” near the S.M. Collemaggio Basilica (City Centre). Take bus no. 4, direction “Terminalbus” from the bus stop opposite to Hotel Castello (The journey takes 5′). You can purchase your ticket on the bus. Take bus no. 4L, direction “FINANZA” from the bus stop opposite to Hotel Castello. (The journey takes 20′-25′). The “TUA” company leaves from the “Terminal Bus Lorenzo Natali” at: 13:00, 13:30, 14:05, 15:00, 15:05, 15:20, 16:15, 17:15, 18:00, 19:00, 20:15. The “GASPARIBUS” company leaves from Hotel Amiternum bus station at: 13:00, ì16:00, 18:00. With Gasparibus: the coach bus service connecting directly Rome airports to L’Aquila (Hotel Amiternum). It is the easiest way to reach L’Aquila from Rome airports. Buses look as pictured, though they can be either white, red, or gold. Bus terminal at Fiumicino airport: just outside the arrival terminal 3; get out the glass sliding door, go right, walk 200m on the sidewalk, and you’ll see it. Bus terminal at Ciampino airport: just outside the main exit, on the left side. With train + TUA bus: you have to get a local train from Airport L. da Vinci Fiumicino (train direction Fara Sabina) that brings you to Stazione Tiburtina, where TUA buses leave to L’Aquila. The trains leave from the Airport every 15 minutes from 5:57 to 23:27 (Monday-Saturday) and every 30 minutes from 5.57 to 23.27 (Sunday & Holidays). The train ticket cost is € 8,50 and the journey takes about 45 minutes. From Stazione Tiburtina (Rome) catch a coach of the bus company TUA to downtown L’Aquila. The bus ticket from Rome to L’Aquila must be purchased before you get on the bus, at the “Autolinee TUA (Biglietteria C)” ticket office. Note: Bus and train ticket fee could slightly vary. If you are arriving from Rome: get off the bus at Hotel Amiternum (only stop in L’Aquila for Gasparibus and first stop for TUA) or to Bus Terminal (downtown, last stop for TUA). If you are arriving from Pescara: get off the bus at the Bus Terminal. Have a look at the position of your Hotel: if near the city center the most convenient stop is the Bus Terminal, while the Hotel Amiternum stop is at 30 min. walking distance from the city center. Taxi: from both Hotel Amiternum and Bus Terminal you may call a taxi at these numbers: +39 0862 0222 / +39 0862 25165. ISSAOS will be held at Università degli Studi dell’Aquila, Dipartimento di Scienze Umane, located in the city center. It is at walking distance from accomodations in the city center, and from the Bus Terminal. You are probably aware that in 2009 L’Aquila was hit by a destructive earthquake, the consequences of which are still evident. L’Aquila is very safe in terms of security, but walking around downtown may present barriers and the atmosphere can sometimes become creepy. We apologize for any inconvenience and hope you will understand. The electric line in Italy supplies AC power at 230 V and 50 Hz. 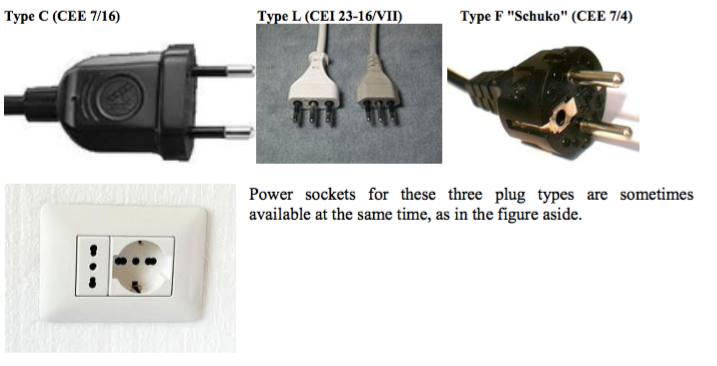 Three types of power plugs are generally used: Type C, Type L, and Type F “Schuko”.